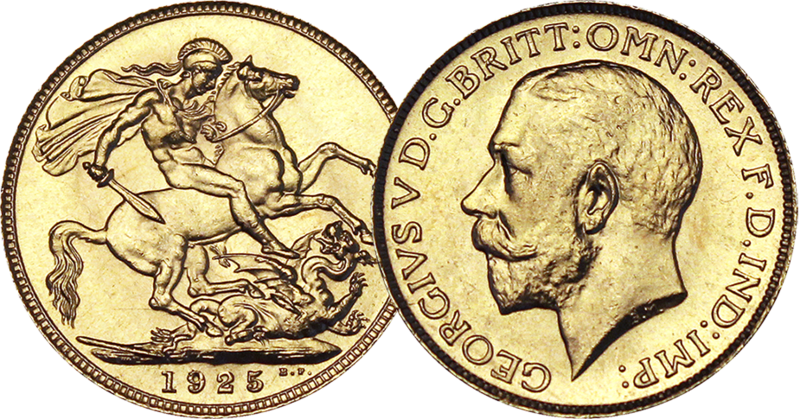 The last Sovereign to feature the portrait of King George V.
Within just days of the outbreak of the First Wold War, in a bid to fund the war effort, the Government requested that members of the public hand in their gold sovereigns. Within a few weeks, the gold sovereign - a symbol of the Empire, and a coin in use since 1817 had been withdrawn. In 1925, Churchill decided to bring back the gold sovereign and announced that Britain would return to the gold standard. For the first time since 1917, the gold sovereign was back in production. The Royal Mint took the opportunity to re-strike a quantity of old and worn sovereigns that had accumulated at the Bank of England since 1917 into new coins dated 1925. However, these coins were actually never authorised for release into circulation. They sat in the gold vaults of the Bank of England and were most likely those used during the Second World War in the ‘survival kit. In addition, many of the sovereigns featuring George V's portrait had been melted down to pay the USA for war materials, which makes this 1925 dated Sovereign a highly-coveted coin in the Sovereigns' history. Incredibly, today The London Mint Office have secured a few of these legendary 1925 Gold Sovereigns struck in London. With very few available secure yours today.